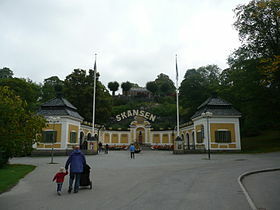 Skansen is the first open-air museum and zoo in Sweden and it attracts more than 1.3 million visitors each year. The many exhibits over the 75 acre (300,000 m²) site include a full replica of an average 19th-century town, in which craftsmen in traditional dress such as tanners, shoemakers, silversmiths, bakers and glass-blowers demonstrate their skills in period surroundings. There is even a small patch growing tobacco used for the making of cigarettes. There is also an open-air zoo containing a wide range of Scandinavian animals including the bison, brown bear, moose, grey seal, lynx, otter, red fox, reindeer, wolf, and wolverine (as well as some non-Scandinavian animals because of their popularity). This article uses material from the Wikipedia article "Skansen", which is released under the Creative Commons Attribution-Share-Alike 3.0 License.